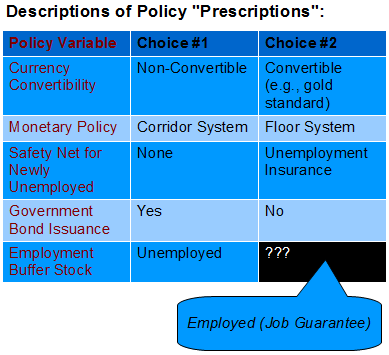 "even mainstream macroeconomics textbooks discuss their own versions of the difference between being on a gold standard and not, the choices for social safety net implementations (such as unemployment insurance), etc. Yet there are plenty of advocates for going back to a gold standard and/or completely removing the safety net -- so there is no universally agreed upon policy choice in any of the above examples. In a sense, to not describe all the relevant policy choices in the context of discussing a particular policy-related topic would be to advocate for the remaining choice(s). " Yes. Its quite odd isnt it that there is no bufferstock of employed persons ever discussed. Well not odd, but it certainly shows a political bias. I'm never clear on the mix of "innocent fraud" versus not-so-innocent among the mainstream. I tend to assume many don't understand the big picture well enough to know better, though there's a chance that's naive of me. Non-convertible is not standard terminology. In fact convertibility is standard usage in official legal communication. So one hears of current account convertibility and capital account convertibility. I understand non-convertible in the mmt context means absence of "official convertibility" to gold or currency of the member asking for conversion but since there exists market convertibility the standard usage is that currencies are convertible. Thanks, Ramanan. I'm guessing most people who would have read this post are primarily familiar with the MMT terminology, but I'm still glad to be aware of the distinction.